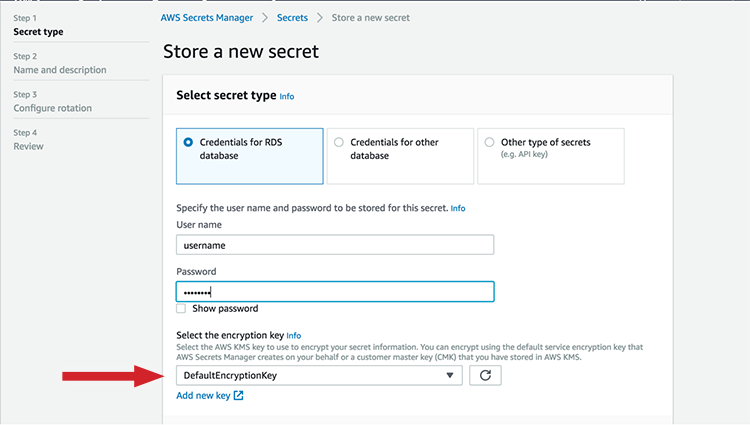 AWS Secrets Manager now integrates with AWS CloudFormation so you can create and retrieve secrets securely using CloudFormation. 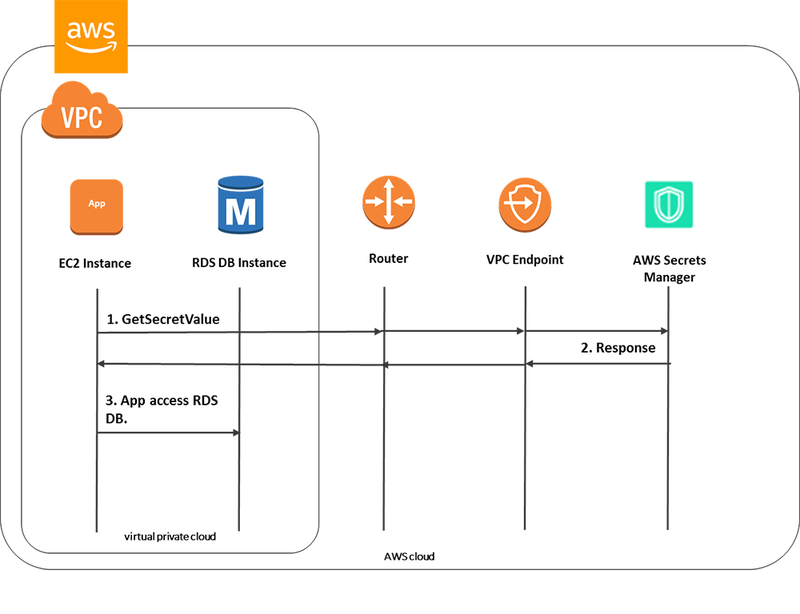 This integration makes it easier to automate provisioning your AWS infrastructure. For example, without any code changes, you can generate unique secrets for your resources with every execution of your CloudFormation template. This also improves the security of your infrastructure by storing secrets securely, encrypting automatically, and enabling rotation more easily. Secrets Manager helps you protect the secrets needed to access your applications, services, and IT resources. In this post, I show how you can get the benefits of Secrets Manager for resources provisioned through CloudFormation. First, I describe the new Secrets Manager resource types supported in CloudFormation. Next, I show a sample CloudFormation template that launches a MySQL database on Amazon Relational Database Service (RDS). This template uses the new resource types to create, rotate, and retrieve the credentials (user name and password) of the database superuser required to launch the MySQL database. Why use Secrets Manager with CloudFormation? CloudFormation helps you model your AWS resources as templates and execute these templates to provision AWS resources at scale. Some AWS resources require secrets as part of the provisioning process. For example, to provision a MySQL database, you must provide the credentials for the database superuser. You can use Secrets Manager, the AWS dedicated secrets management service, to create and manage such secrets. Secrets Manager makes it easier to rotate, manage, and retrieve database credentials, API keys, and other secrets throughout their lifecycle. You can now reference Secrets Manager in your CloudFormation templates to create unique secrets with every invocation of your template. By default, Secrets Manager encrypts these secrets with encryption keys that you own and control. Secrets Manager ensures the secret isn’t logged or persisted by CloudFormation by using a dynamic reference to the secret. You can configure Secrets Manager to rotate your secrets automatically without disrupting your applications. 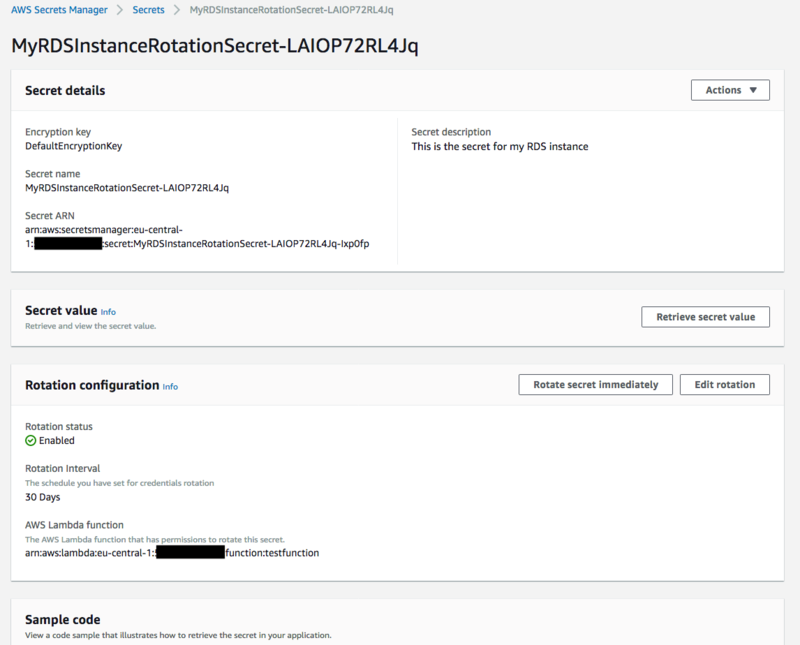 Secrets Manager offers built-in integrations for rotating credentials for all Amazon RDS databases and supports extensibility with AWS Lambda so you can meet your custom rotation requirements. 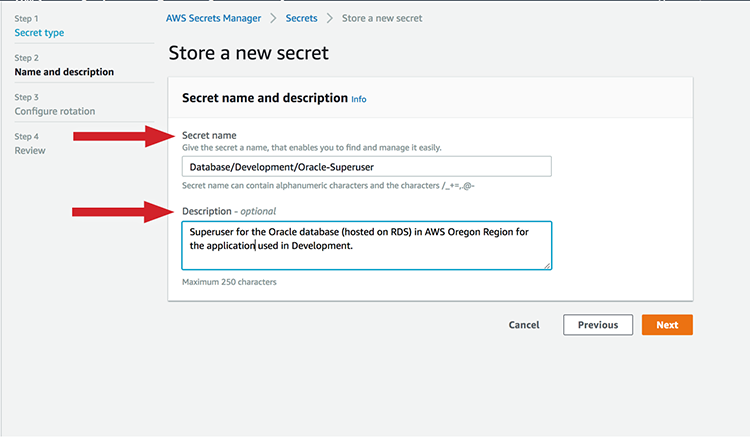 AWS::SecretsManager::Secret — Create a secret and store it in Secrets Manager. AWS::SecretsManager::ResourcePolicy — Create a resource-based policy and attach it to a secret. Resource-based policies enable you to control access to secrets. AWS::SecretsManager::SecretTargetAttachment — Configure Secrets Manager to rotate the secret automatically. AWS::SecretsManager::RotationSchedule — Define the Lambda function that will be used to rotate the secret. Now that you’re familiar with the new Secrets Manager resource types supported in CloudFormation, I’ll show how you can use these in a CloudFormation template. 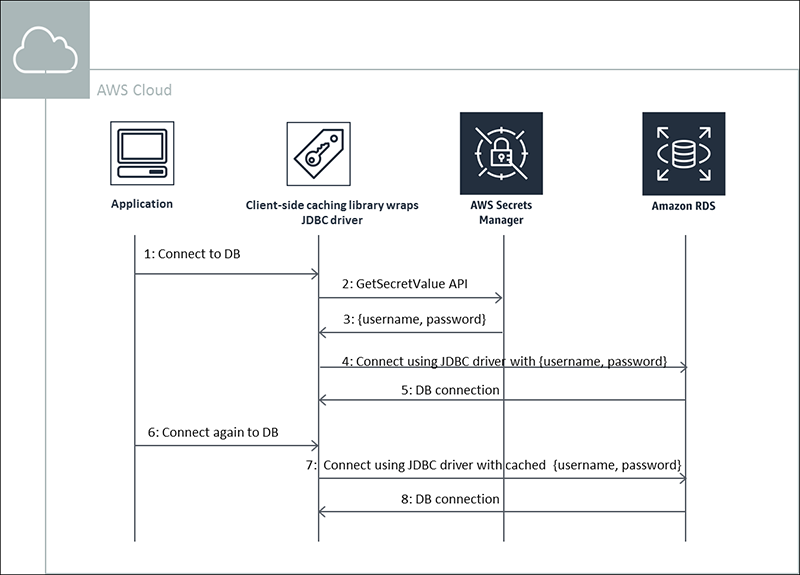 I will use a sample template that creates a MySQL database in Amazon RDS and uses Secrets Manager to create the credentials for the superuser. The template also configures the secret to rotate every 30 days automatically. Create a stack on the AWS CloudFormation console by copying the following sample template. 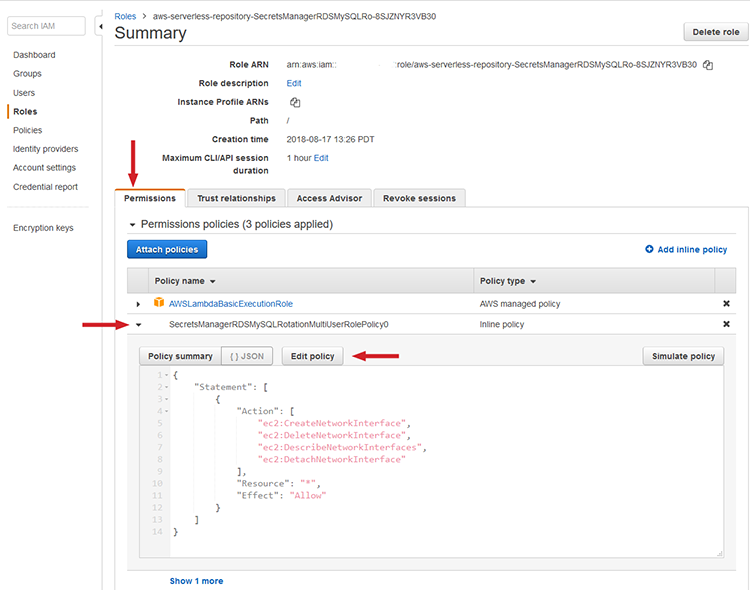 Description: "How to create and retrieve secrets securely using an AWS CloudFormation template"
# Create a secret with the username admin and a randomly generated password in JSON. # Create a MySQL database of size t2.micro. # Update the referenced secret with properties of the RDS database. # Schedule rotating the secret every 30 days. # Note, the first rotation is triggered immediately. # This enables you to verify that rotation is configured appropriately. # Subsequent rotations are scheduled according to the configured rotation. 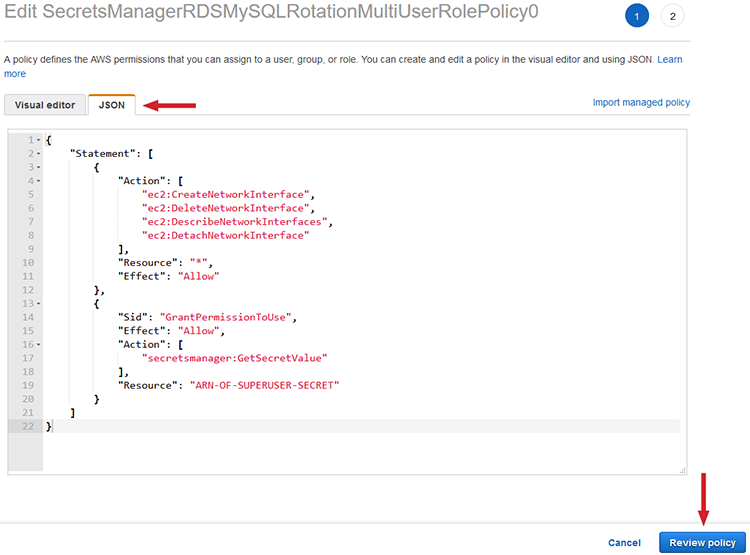 After you execute the stack, open the RDS console to verify the database, rotation-instance, has been successfully created. Open the Secrets Manager console and verify the stack successfully created the secret, MyRDSInstanceRotationSecret. I showed you how to create and retrieve secrets in CloudFormation. This improves the security of your infrastructure and makes it easier to automate infrastructure provisioning. To get started managing secrets, open the Secrets Manager console. 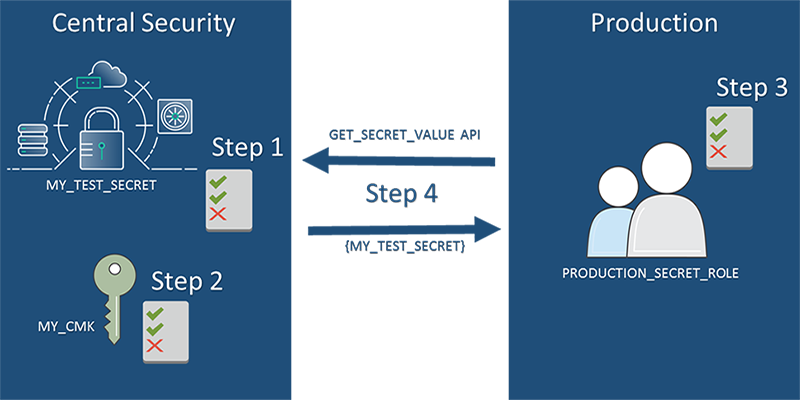 To learn more, read How to Store, Distribute, and Rotate Credentials Securely with Secret Manager or refer to the Secrets Manager documentation. 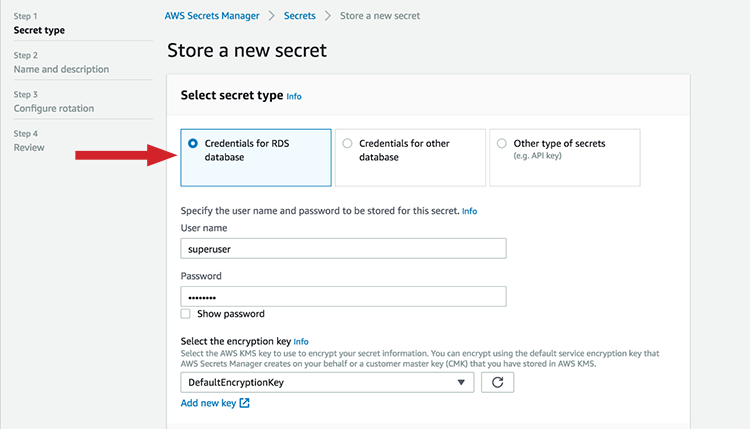 You can use AWS Secrets Manager to rotate, manage, and retrieve secrets such as database credentials and API keys throughout their lifecycle. And you can now use these secrets across AWS accounts by attaching resource-based policies to secrets. For example, you can manage secrets in one AWS account and grant employees or applications in other AWS accounts permissions to use these secrets. Similarly, you can share a secret with a business partner, such as a managed service provider (MSP), without transmitting the secret through channels such as email and handwritten notes. Resource-based policies also enable you to control who can manage permissions on a secret. For example, you can grant an employee permission to administer a specific secret. When granting access to secrets, it’s important to keep in mind that, by default, IAM principals (users and roles) don’t have permission to access secrets. 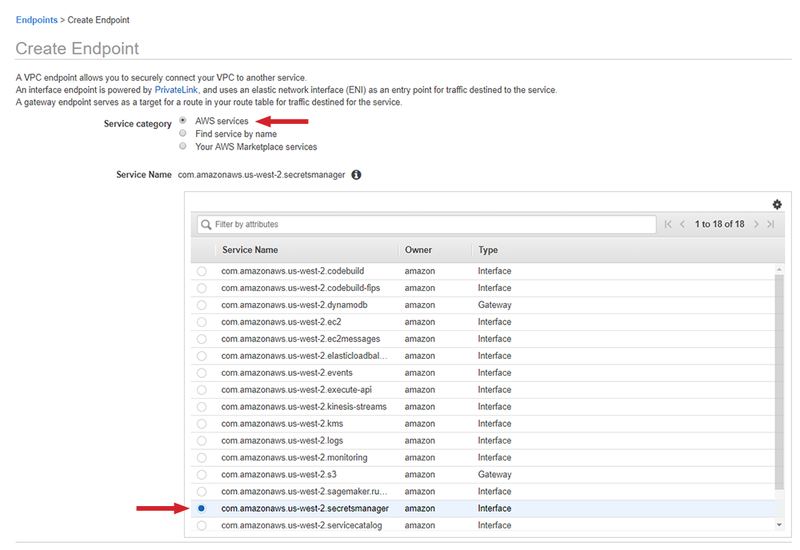 In addition to policies attached to IAM principals in your account, you can use resource-based policies to control this access within your AWS account or across accounts. When you grant access to a secret, IAM principals also need access to the encryption keys used to encrypt secrets. Therefore, to enable cross-account access, you must grant permissions to access the secret and the encryption key used to encrypt the secret. Create a resource-based policy and attach it to the secret in the CENTRAL_SECURITY account. Update the key policy for the CMK in the CENTRAL_SECURITY account. Grant IAM role permissions to retrieve this secret in the PRODUCTION account. Verify access by retrieving the secret in the PRODUCTION account. Paste the following text in a file that you save with the name RESOURCE_POLICY.json. For this blog, I’ll create a policy that grants permissions to read the secret MY_TEST_SECRET. I’ll use the Principal element of the policy to define the role that can access this secret, and the Condition element of the policy to restrict access to the most recent version of the secret. Next, from the AWS CLI, run the Secrets Manager put-resource-policy command to attach this policy to the secret. You’ve successfully updated the permissions for this secret. When the PRODUCTION account no longer needs access to your secret, you can use the delete-resource-policy command to remove the resource-based policy. You can also manage access by updating the content of the resource-based policy and using the put-resource-policy command to attach this updated policy to the secret. Secrets Manager encrypts secrets by default and entities retrieving these secrets need access to decrypt them using the MY_CMK. To grant these permissions, run the get-key-policy command to view the key policy for MY_CMK. Next, update the key policy by adding the following permissions to the key policy. For this example, I grant the IAM role, PRODUCTION_SECRET_ROLE, permission to use MY_CMK. The policy below grants the capability to use the Decrypt and DescribeKey commands with MY_CMK. Finally, from the AWS CLI, call the put-key-policy command to update the policy attached to MY_CMK. Note: Steps 1 and 2 enable you to independently control who can access secrets across AWS accounts. You must grant both sets of permissions to enable cross-account access to secrets. I perform the next steps in the PRODUCTION accounts as an IAM administrator. To retrieve the secret from the CENTRAL_SECURITY account, the cross-account role also needs IAM permissions to retrieve the secret and decrypt it using the central security CMK. To grant these permissions, paste the following text in a file and save it with the name PERMISSIONS_POLICY.json. Next, use the IAM create-policycreate-policy command to create the permissions policy, SECRETS_MANAGER_PERMISSIONS_POLICY. Then, use the IAM attach-role-policy command to attach this permissions policy to the IAM role, PRODUCTION_SECRET_ROLE. You’ve now successfully granted the IAM role permissions to read the secret. To test the configuration, use the PRODUCTION_SECRET_ROLE to run the get-secret-value command from the PRODUCTION account. You’ve successfully retrieved the secret, MY_TEST_SECRET, from your PRODUCTION account. In this post, I showed you how to access secrets in Secrets Manager across AWS accounts. 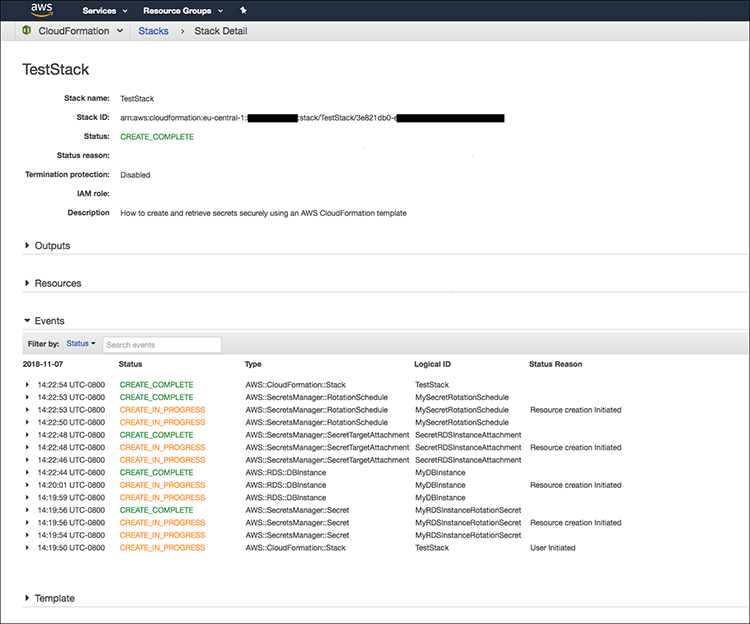 This allows you to manage secrets in one AWS account and grant employees or applications in other AWS accounts permissions to use these secrets. To get started managing secrets, open the Secrets Manager console. To learn more, read the Secrets Manager documentation.